"These latkes are so light and fluffy that they melt in your mouth. These are great served with applesauce and sour cream." Bring a large pot of salted water to a boil. Add potatoes and cook until tender but still firm, about 15 minutes. Drain, cool and mash. In a medium bowl, mix shredded Yukon Gold potatoes, mashed potatoes and onion. Add in eggs, matzo meal and salt; mix well. Feel consistency of the dough; mixture should hold together without being sticky. If it sticks to your hands, add more matzo meal until dough is no longer sticky. In a large skillet over medium heat, warm enough oil or butter or margarine to cover 1/4 inch of the skillet. When hot, drop mixture by heaping tablespoon to oil; flatten with a spatula and cook on both sides until golden brown. Serve. Watch how to make these top-rated potato latkes. Mine did not turn out light and fluffy. And the taste wasn't that great either. I was disappointed. I t could have been the recipe or the cook...i don't know...try 4 yourself. 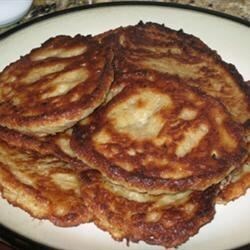 I have just tried this recipe for latkes, it is wonderful. The only difference for me is to shred the potatoes and not cook them first. I also add a couple of cloves of garlic to the mix. We LOVED this recipe. It was delicious. The latkes were fluffy, tasty and easy to make. This has become a Hanukkah staple in our house. The latkes were tasty & will be my new favorite Hannuka recipe. They even freeze quite well, without too much loss in flavor!